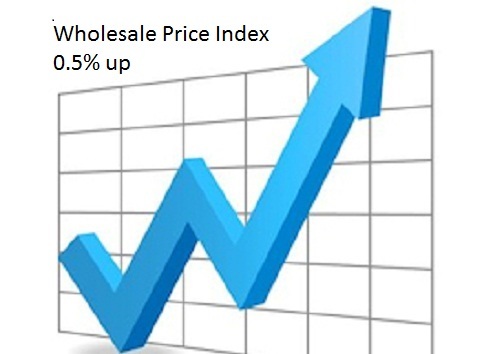 The official Wholesale Price Index for ‘All Commodities’ (Base: 2004-05=100) for the month of February, 2017 rose by 0.5 percent to 185.5 (provisional) from 184.6 (provisional) for the previous month. The annual rate of inflation, based on monthly WPI, stood at 6.55% (provisional) for the month of February, 2017 (over February, 2016) as compared to 5.25% (provisional) for the previous month and -0.85% during the corresponding month of the previous year. Build up inflation rate in the financial year so far was 5.82% compared to a build up rate of -1.14% in the corresponding period of the previous year. The index for ‘Minerals’ group rose by 9.0 percent to 234.8 (provisional) from 215.5 (provisional) for the previous month due to higher price of manganese ore (24%), crude petroleum (13%), copper ore (11%), chromite (8%), iron ore (3 %) and zinc concentrate (2%). However, the price of sillimanite (11%) declined. The index for this major group rose by 1.3 percent to 203.8 (provisional) from 201.2 (provisional) for the previous month due to higher price of coking coal (15%), aviation turbine fuel (3%), bitumen (2%) and kerosene, high speed diesel, LPG and lignite (1% each). However, the price of furnace oil (1%) declined. The index for ‘ Beverages, Tobacco & Tobacco Products ‘ group declined by 0.2 percent to 221.5 (provisional) from 221.9 (provisional) for the previous month due to lower price of zarda (7%) and beer (3%). However, the price of soft drinks & carbonated water and rectified spirit (1% each) moved up. The index for ‘ Textiles ‘ group rose by 0.2 percent to 142.6 (provisional) from 142.3 (provisional) for the previous month due to higher price of tyre cord fabric (4%) and man made fabric (2%). However, the price of jute sacking cloth and jute sacking bag (1% each) declined. The index for ‘Wood & Wood Products’ group declined by 0.4 percent to 191.8 (provisional) from 192.6 (provisional) for the previous month due to lower price of plywood & fibre board (1%). The index for ‘Leather & Leather Products’ group declined by 0.3 percent to 145.1 (provisional) from 145.5 (provisional) for the previous month due to lower price of leather footwear (1%). However, the price of leathers (1%) moved up. The index for ‘Rubber & Plastic Products’ group rose by 0.2 percent to 148.9 (provisional) from 148.6 (provisional) for the previous month due to higher price of rubber products (1%). The index for ‘Chemicals & Chemical Products’ group rose by 0.4 percent to 151.5 (provisional) from 150.9 (provisional) for the previous month due to higher price of non-cyclic compound (4%), turpentine oil (3%) and basic organic chemicals, synthetic resin, explosives, ayurvedic medicines and toilet soap (1% each). However, the price of rubber chemicals and pesticides (1% each) declined. The index for ‘Non-Metallic Mineral Products ‘ group rose by 0.1 percent to 178.8 (provisional) from 178.6 (provisional) for the previous month due to higher price of railway sleeper (3%) and grey cement (1%). However, the price of glass bottles & bottleware and marbles (1% each) declined. The index for ‘Basic Metals, Alloys & Metal Products’ group declined by 0.5 percent to 160.4 (provisional) from 161.2 (provisional) for the previous month due to lower price of pig iron (5%), pipes/tubes/rods/strips, gp/gc sheets and wire rods (3% each), pencil ingots and HRC (2% each) and rounds, angles, sheets, CRC and rebars (1% each). However, the price of ferro chrome (7 %) and steel castings, gold & gold ornaments, pressure cooker, silver, iron & steel wire, steel: pipes & tubes, ferro silicon and aluminium (1% each) moved up. The index for ‘Transport, Equipment & Parts’ group rose by 0.5 percent to 140.5 (provisional) from 139.8 (provisional) for the previous month due to higher price of auto rickshaw / tempo / matador (4%) and auto parts (1%). For the month of December, 2016, the final Wholesale Price Index for ‘All Commodities’ (Base: 2004-05=100) stood at 183.3 as compared to 182.8 (provisional) and annual rate of inflation based on final index stood at 3.68 percent as compared to 3.39 percent (provisional) respectively as reported on 16.01.2017.